A collection of three stories, based on The Moomins and the Great Flood and the episodes The Magicians hat and Hattifatteners Island from Finn Family Moomintroll. Simplifying the stories and character universe from Tove Jansson’s original novels, the reader will familiarize themselves with the Moomin family, their closest friends and the magic of Moominvalley. The stories are re-told for a younger audience and beautifully illustrated throughout. 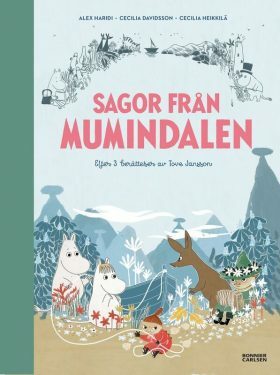 These all new picture book versions of the original storylines will tell children how the Moomins ended up in Moominvalley, but also the ever important values of family, friendship, respect for nature and how a little bit of magic will create a wonderful world, open to all and everyone.